San Francisco is a super expensive city, it’s comparable to visiting a Swiss or Scandinavian city in Europe. When you stay here you must accept that you will spend more money than in other US cities. I found that staying in a hotel around Van Ness street was the best value. I stayed in the Inn on Broadway which is located on Van Ness and Broadway, it’s not cheap but nowhere is cheap here! Staying here meant I could park the car for free and leave it in the hotel whilst walking the city on foot. The Golden Gate bridge is probably the most famous bridge in the world. It has featured in many movies and a visit to this famous bridge doesn’t disappoint. 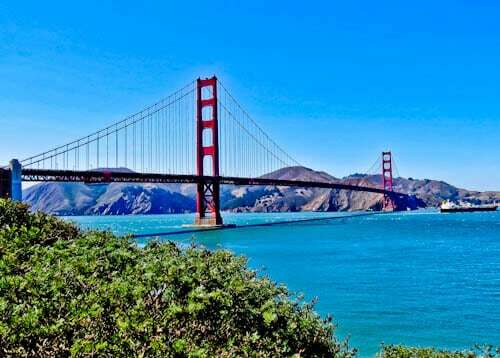 Here are a few interesting Golden Gate Bridge facts. It’s constantly being painted. By the time they finish painting it, it needs repainting! The Golden Gate Bridge features in the following movies; San Andreas, Vertigo, Rise of the Planet of the Apes and James Bond. As a photographer, the bridge was my favorite part of San Francisco. The best photo opportunities come as you head towards it on the promenade. Moreover, when you cross the bridge you can feel it shaking. Alcatraz needs no introduction, it’s a notorious prison located on a island visible from San Francisco. However, to visit Alcatraz nowadays is quite difficult. Due to its popularity, more often than not, tours are fully booked days in advance. For this reason, you must book your visit well in advance. Ferries leave from Pier 33 which is a short walk from Fisherman’s Wharf. Alcatraz Island has been in many movies including, Escape from Alcatraz and The Rock. Finally, there’ll probably be an ex-prisoner selling and signing his book on the Island. Fisherman’s Wharf is the main tourist area of San Francisco. There are lots of stalls selling sourdough bread bowls filled with crab and clam chowder. 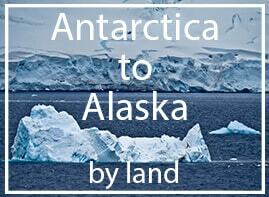 In addition, there’s a colony of sea lions and hundreds of birds feeding on people’s leftovers. A photograph with the iconic Fisherman’s Wharf sign is a must. Lastly, modern yellow San Francisco trams leave from Fisherman’s Wharf, passing the piers before reaching the downtown area. These yellow trams are incredibly photogenic and often much quieter than the historic cable cars. 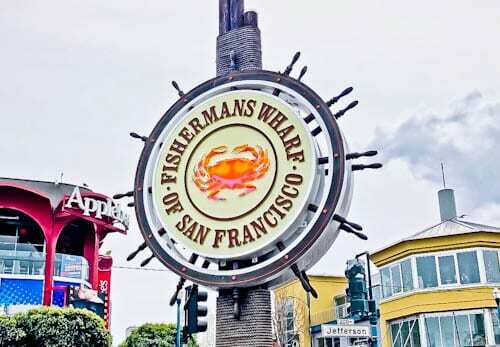 The famous Pier 39 is part of the Fisherman’s Wharf area. 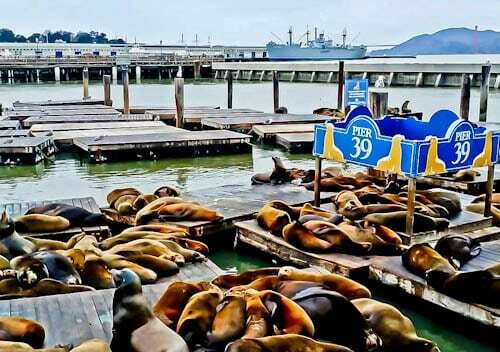 At Pier 39 you’ll find waterfront restaurants, bars, street performers, live music, shopping and lots of sea lions. 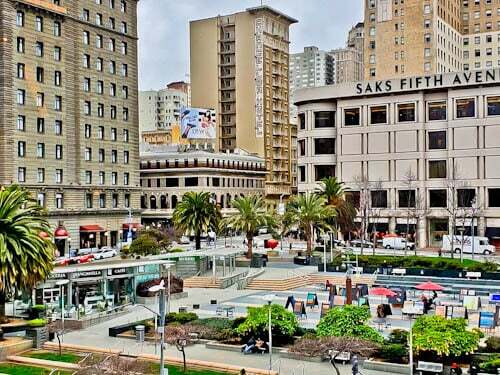 Union Square is the central square of downtown San Francisco. It’s surrounded by upscale shops and hotels. In addition, it’s surrounded by several San Francisco landmarks including some of its iconic buildings. Finally, in the center of square is a statue of Nike, the Greek Goddess of Victory. Did you know there’s also a statue of Nike at the Olympiastadion in Berlin? 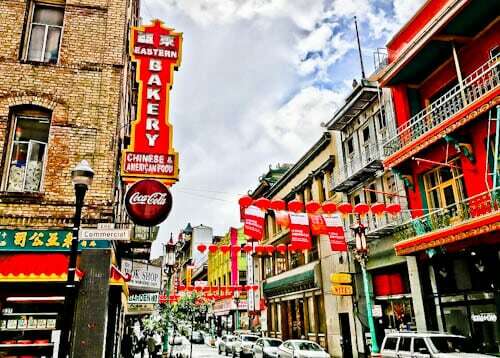 The most famous Chinatown of the USA is that of San Francisco. There are several blocks of the city where you’d be forgiven if you thought you were in China. Adjacent to Chinatown is the Instagram worthy Nob Hill area of San Francisco. The Nob Hill district of San Francisco features both colorful and historic mansions. These are stunning to see in their own right. 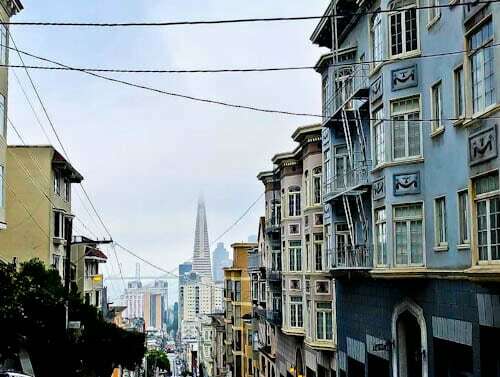 However, combine these with panoramic views of the Golden Gate Bridge, steep streets and other San Francisco landmarks makes Nob Hill a top San Francisco Instagram spot. 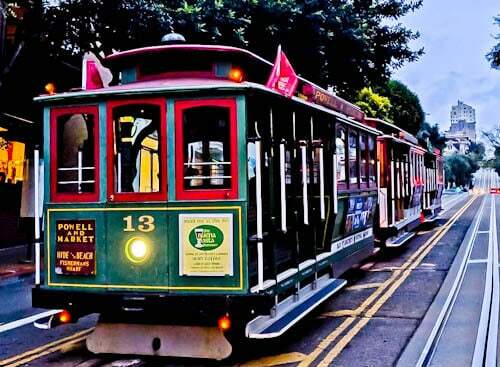 San Francisco is famous for its traditional cable cars which still run on Taylor street. You can take the traditional cable car from the Powell / Mason cable car turnaround adjacent to Fisherman’s Wharf. Alternatively, modern cable cars leave from Powell and Beach, passing the piers then going to the heart of downtown. Lastly, you’ll see these historic cable cars in movies such as Vertigo and The Rock. Before leaving San Francisco I wanted to drive on the famous Lombard Street. 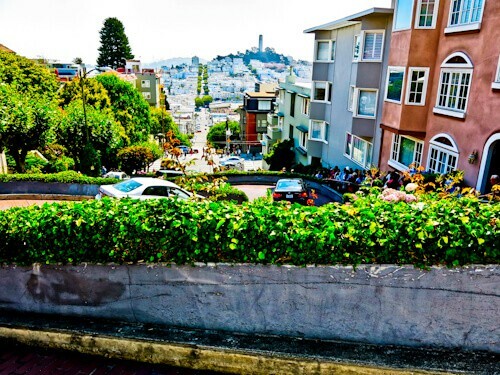 It is claimed that Lombard street is the crookedest street in the world. Because the road is so steep, for safety reasons they made the road wind around. Lombard street appears in some computer games and also in the Hitchcock movie, Vertigo. You’ll see lots of tourists here taking photos as well as driving on it. For this reason, if you’re in a rush to leave San Francisco, don’t go this way! Coit Tower is part of Pioneer Park. Why is it called Coit Tower? It’s named after Lillie Hitchcock Coit whose mission was to make San Francisco a beautiful city. 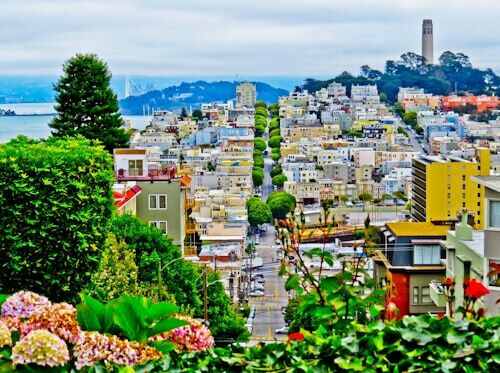 Today you can ascend Coit Tower for panoramic views over the bay as well as the San Francisco landmarks. Even if you decide not to visit the tower, it has a prominent position in the San Francisco skyline. The Muir Woods National Forest is famous for huge redwood trees. Additionally, there are various walking trails through the park. You may recognise some of the scenes from the movie, Rise of the Planet of the Apes. Lastly, it’s possible to visit Muir Woods on a organised trip from San Francisco. 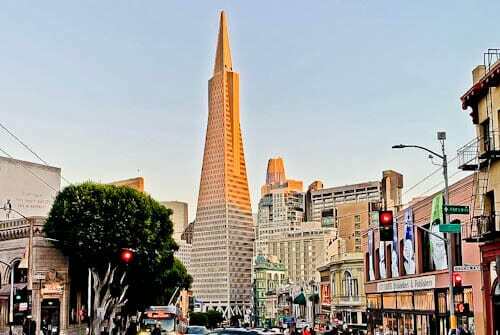 The Transamerica Pyramid is definitely the most identifiable in the San Francisco skyline. It’s the second tallest building in San Francisco and the third tallest pyramid shaped building in the world. In fact, only the Ryugyong Hotel in North Korea and Shard in London are taller pyramids. 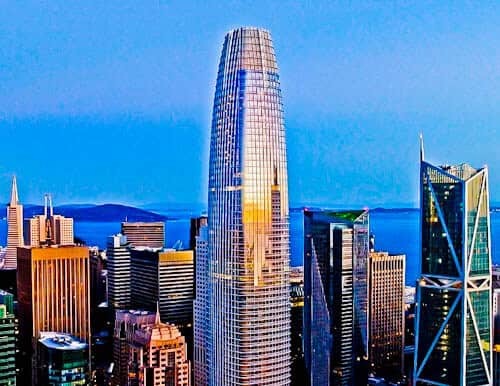 At 326 meters high, the Salesforce Tower is the tallest building in San Francisco. 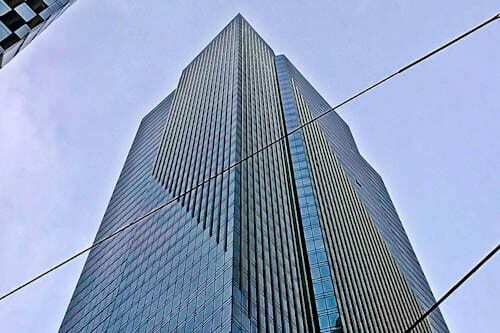 It’s also the second tallest building in the West after the Wilshire Grand Center in Los Angeles. Finally, it photographs beautifully at sunset with its reflective windows. You may have heard of Millenium Tower in the news. It became famous as it’s both a sinking and now a leaning building. Due to its size, it’s difficult to see the lean. Nonetheless, it’s now known as the Leaning Tower of San Francisco, of course, inspired from the Leaning Tower of Pisa in Italy. My next destination is Reno which is a straightforward drive on east on I-80. This route passes the capital city of California, Sacramento as well as Lake Tahoe before crossing the border in Nevada. I would say 100% book in advance! I love your photos, I only had a short time to visit San Francisco so I definitely need to return soon! I want so badly to go to St Francisco!!!!! I always stay at the Fort Mason Youth Hostel. Fabulous location and views. San Francisco is one of my favorite cities in the US! It’s an hour flight from SoCal, so we tend to go frequently. Lombard street never gets old! This is probably embarrassing but I’ve always wanted to go to SF because of the old TV show That’s So Raven. I knew very little else about it until reading your post so I’ll be saving this for the future. Have fun in Reno! I just got back from visiting San Fransisco about a month ago. This time of year, it was very hard to get a clear day. There were actually mudslides that closed the road to Santa Cruz. We spent about two weeks there in total, mostly on personal business but the final day in the city the weather cleared. We rushed over to the Golden Gate Bridge and took lots of pictures. Fun post and it looks like you have a lot more travels ahead of you. My home!!! This was so fun to read. It sounds like you liked it, although you never really flat out said that… 🙂 Did you? You went to so many great spots and it looks like the weather was nice while you were here! Especially if you were in a t-shirt. Haha. Great info, thanks for sharing!! Another brilliant city post and this time it is one of the most iconic cities of the world. Although I haven’t been there as an adult, I am aware of the all the spots you mention and without a doubt they should be on everyone’s must visit list of the city. 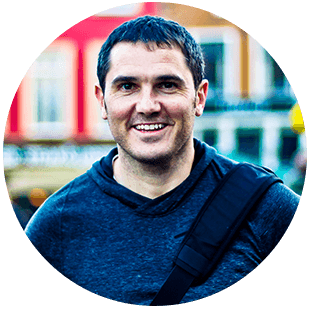 Another great post, James – San Francisco has been on my list of places I want to visit for quite a while now. I’d love to visit Alcatraz (I’ve always been fascinated by its history and saw Escape from Alcatraz so many times, I lost count), so that would definitely be my first stop – with the Golden Gate Bridge as a close second! I had no idea it was earthquake-proof and had to be re-painted so many times, though! My hubby really wants to head here! I am happy to read that the bridge is earthquake proof. I hope they rebuild things to be earthquake proof everywhere else they have one. Alcatraz looks interesting, but too morbid for me. I would be happy taking the cable car downtown and back several times before going on a tour there. A lot of our friends stay in SFO and they keep inviting us to visit. While in the States, we could not visit SFO because of the super expensive flight rates. Escape from Alcatraz is one of my favorite movies, I would love to visit this museum. Would also love to visit the ever famed Lombard street. 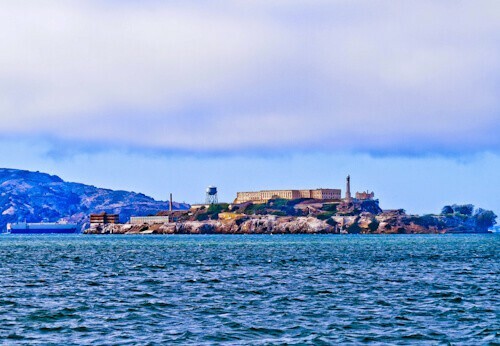 Love the picture of the Alcatraz Island.